The name is derived from the Greek ‘tekhnetos’, meaning artificial. A radioactive, silvery metal that does not occur naturally. It was the first artificially synthesised element (hence its name), first discovered in molybdenum that had been subjected to atomic bombardment. It is today obtained as a grey powder and in tonne quantities from spent nuclear fuel rods. 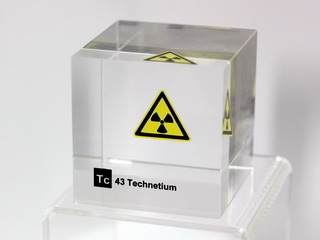 Early chemists puzzled over why they could not discover element number 43, but now we know why : its isotopes are relatively short lived compared to the age of the Earth, so all the original technetium present when the Earth was formed has long since decayed.